Stronghold Antivirus is a lightweight and user-friendly antivirus and antimalware for everyday use both at home and in the office. Unlike other antiviruses it doesn't consume a lot of resources, it doesn't confuse you with difficult to understand windows and complex options. On the contrary, Stronghold Antivirus with one-click to scan, zero-click to shield interface with all tunes is already made for you, for fast and comfortable work and entertainment.. However, if you are a professional and want to take everything under control only one click - and you get all necessary settings and features you may ever need, including customization of scanning and protection areas, startup options, scanning scheduler, white and black lists, changes restore and much more. Both you and your kid will find the best way to interact with Stronghold Antivirus. Want no questions protections? Here you are! Want deeply-customized and fine-tuned instrument? Here you are again! Stronghold Antivirus is an "Anti-Virus" antivirus, AntiSpyware antivirus, AntiRootkit antivirus, and so on, including trojans, adware, keyloggers, dialers, malware, hijackers and all new types of both online and offline threats that appear every day. You do not need numerous separate programs to feel yourself secure anymore. Stronghold Antivirus combines them all. We might call it Stronghold Antispyware or Stronghold Antimalware easily, but the word "Antivirus" still identifies the most important direction in protecting computers from threats and cybercriminals. Stronghold Antivirus combines both on-access and on-demand protection. This means that it will look for every change in your system, every incoming file or installing program, any inserted media and any downloaded document for the signs of virus or spyware activity and it will delete it even before malicious program can do anything harmful. It will show you the name of identified and intercepted infection if it is a known one or show its malicious behavior if it is an unknown one and was found using extensive heuristics system. However, if you don't want to wait until malicious program or virus uncovers itself, you can use on-demand protection part of Stronghold Antivirus. Just tell him scan your computer, certain parts of it or removable drives for viruses, spyware and other types of malware and Stronghold Antivirus will quickly find all infections deep inside your system and easily eliminate them. All our army of security specialists, analysts and support team work for you 24/7 to find all malicious newcomers, identify them, take their footprints and grow our database of viruses, spyware and malware, every day. At the same time they increase the ability of Stronghold Antivirus to find and eliminate potentially dangerous programs and unknown infections. At last, our support team is ready to help you with every problem you might face, any time of day and night. We will use all modern ways to cure your computer even in difficult situations, starting from simple text-chat to remote logging to your computer and remote curing using our proprietary security technologies. When purchasing Stronghold Antivirus you get personal security specialist for the price of antivirus. Why should I choose Stronghold Antivirus and not other products? 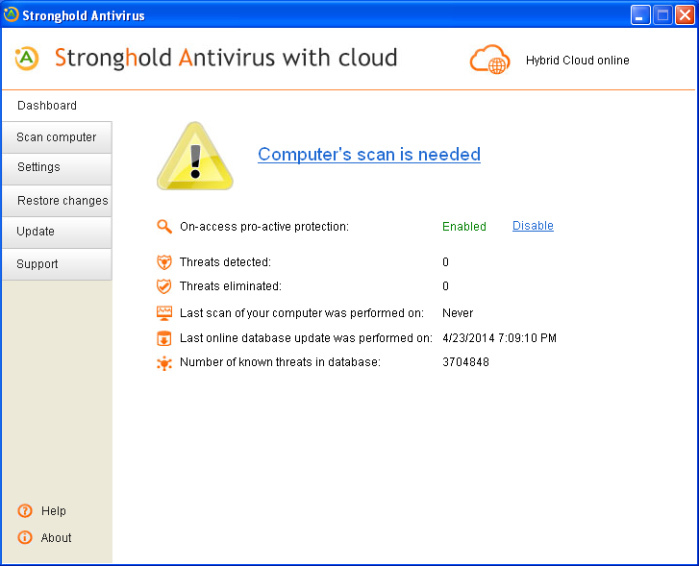 Stronghold Antivirus is extremely lightweight antivirus and antispyware. It doesn't consume much system resources. You will never notice any delays in running applications or opening documents. You will always have enough memory and CPU power to run your favourite programs and games. Stronghold Antivirus protects not only from classical viruses but from all kinds of online and offline threats including spyware, adware, Trojans, keyloggers, rootkits and other kinds of threats. You do not need many programs and many solutions. Stronghold Antivirus will provide you with all the protection you need, ever, for a single price. Stronghold Antivirus is so easy to use that even a kid can manage it. You do not need to be PhDs to enjoy the most modern and powerful antivirus, antispyware and antimalware protection available. Before you realize, that Stronghold Antivirus is exactly what you need to protect your computer and your documents against viruses, spyware, adware, Trojans, and other kinds of malware on your PC, look through its key features. Q: Which kinds of infections does Stronghold Antivirus fight with? A: Stronghold Antivirus find and eliminates viruses, spyware, adware, malware, keyloggers, dialers, rootkits, toolkits, hijackers, trackware and over 50 other types of modern offline and online threats. There are more than 500,000 separate viruses and malware in our database now and it is growing every hour. Moreover, Stronghold Antivirus can find and eliminate even unknown threats based on their malicious behavior. Q: Antivirus *** tells that they know over million threats. Is it better than yours? A: Great question! There are several different ways how to count separate malware samples. Some our competitors count all separate items that are included into virus sample (like each separate file and registry entry) and this is why they get number over one million. In fact, there are no million different types of viruses and malware in nature. At least, not yet. We use honest way to calculate threats in our database, and this is why our number may be lower than competitors', but our protection definitely outperforms them. Q: Are there any independent public reviews of Stronghold Antivirus on the internet? Yes, For example: Review of Stronghold Antivirus from Top Software Reviews. Q: I have *** infection. How can I be sure that Stronghold Antivirus finds and kills it? A: You can purchase Stronghold Antivirus keeping in mind our 30 days satisfaction policy. If for some reason Stronghold Antivirus can’t help you with some specific problem, our support team really can. They will work with you free of additional charge until your problem is solved. If we can't solve your particular problem within one week from your initial request, we perform a full refund of your order. This is guaranteed. Period. Q: How often do you update antivirus database of Stronghold Antivirus? A: In most cases, we issue new updates once per day. However, in case of emergency or epidemic we issue new updates even more often. This allows us to protect you from malicious newcomers that spread over the Internet with a lightning speed sometimes. Q: Can Stronghold Antivirus update itself automatically? Can it warn me about necessity of database updates? A: Yes, sure, it will. It can both update fully automatically with prescribed frequency or warn you about outdated database and offer to update manually. You can define how often should Stronghold Antivirus check for available updates. You can also switch such notifications off if you prefer and update manually. Q: I need to protect computer that doesn't have direct Internet access. Can I still update Stronghold Antivirus? A: Of course, you can. You can update Stronghold Antivirus not only from the Internet, but from the local file as well. You just need to download antivirus update from our web site or ask your network administrator to do this, then update Stronghold Antivirus from the local file or from the network location. Q: How can Stronghold Antivirus protect me from unknown threats? A: Stronghold Antivirus monitors system-critical areas like system folders, processes, autorun entries, registry entries, BHOs, cookies and others in real time and looks for signs of malicious or potentially unsafe activity. If such activity is identified, Stronghold Antivirus shows alert window with the information about the suspicious program, and if the user chooses to, kills the troubled application. Q: Will Stronghold Antivirus slow down my computer? A: No! We developed Stronghold Antivirus keeping in mind that we ourselves are tired of anti spyware, antiviruses that won't allow to work and entertain as usual because they slow down the computer. Stronghold Antivirus is very clever and lightweight program and you will not notice any impact to your system’s performance while using it. You can see yourself that in average it consumes no more than 5% of CPU or even less, while constantly providing full-scale protection from all kinds of offline and online threats like viruses and spyware. Q: Can I make Stronghold Antivirus solve problems and delete spyware and viruses without questions? A: Yes, sure. Stronghold Antivirus has an option to solve all found problems automatically, without asking user of it. The best available action will be executed in each case when some problem or threat is found. Your question is not listed here? Contact us and receive reply in 12 hours or even less!